I’ve been sneaking in some stitches on my goldwork circular frame project, here and there, when I can. And my “some” stitches, I mean very few stitches. I’d hoped to be finished with the couched gold passing thread by now, but in fact, I’m barely started! If you’re just joining us and you’re wondering about the backstory on this particular embroidery project, I’ve included some links at the end of today’s article so that you can explore the project further. See what I mean by very few stitches? In concept, laid threads in goldwork are really easy – they’re simply couched onto the fabric. If you’re not sure what couching is, this video tutorial will help you. Essentially, couching is embroidery involving two threads. One is the laid thread (the one that lies on top of the fabric and doesn’t pass through the fabric except at the beginning and end of the thread) and the other is the couching thread, which sews the laid thread onto the fabric. Gold passing thread (which is explained in this article) is normally couched in pairs. Probably the most difficult aspect of couching a lot of gold passing thread on a project like this? It gets a little boring! 1. Your couching stitches should be evenly spaced. The couching stitches are often (though not always) worked in a bricking pattern, so that each new layer of couching stitches is off-set between the previous layer. 2. The couching stitches should be perpendicular to the laid threads. They shouldn’t be slanting all over the place at different angles. 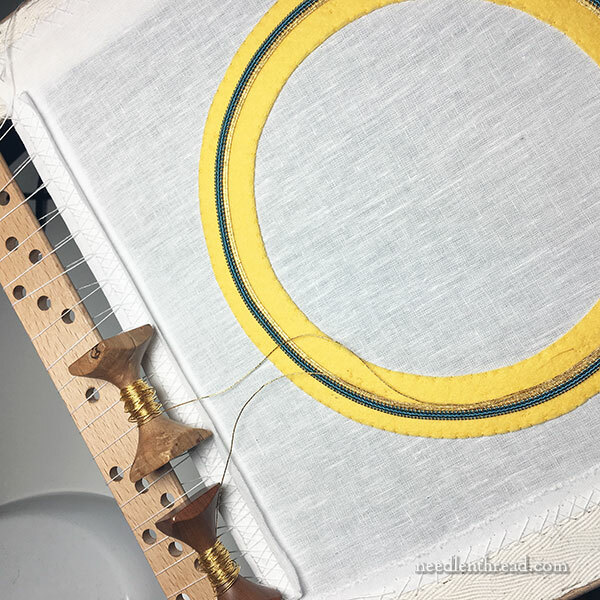 When couching a lot of passing thread on a large area and working in pairs, it helps to have either two spools of the same thread, so that you’re pulling one thread from one spool and one from the other, or it helps to have a pair of special goldwork tools called koma. Koma come from Japanese goldwork. They are wooden spools with squared ends, so that the spools sit on the surface of the framed embroidery fabric. The laid gold threads are wound onto the koma, and then the embroiderer pulls each thread off the koma while couching them. The difference is that the squared ends on the koma keep them from rolling about. Very handy, indeed! The arrow in the photo above points to the little outward curve in the gold passing thread, where the new round going around the frame begins. In my mind, this little outward curve seems Massive. I keep worrying that it will create a noticeable wave on the frame. In fact, it’s not that large of a curve, and with round, it becomes even less noticeable, so I will probably stop thinking about it altogether once I make it around the frame another time or two! So that’s as far as I’ve gotten on this project. Today, I plan to spend a good hour or so on it, and hopefully that will get the passing thread finished! Salvaging Figure Embroidery – a look at the antique ecclesiastical embroidery that I salvaged, that I’m reframing in this new goldwork frame. If you’re looking for more information on goldwork and ecclesiastical embroidery, you’ll find plenty of articles in my goldwork archive here and plenty of articles to explore in my ecclesiastical embroidery archives here. If you’re looking for church patterns for hand embroidery, you might be interested in my e-book of Church Patterns, which you can find available here. The goldwork is coming along nicely but I agree with you that is a lot of couching, but will look lovely once completed. The Koma looks like a really useful accessory and a great way to couch with 2 threads. I have just looked Koma up and you can buy them in the UK at Midori Matsushima’s Japanese Embroidery Website. they are very reasonably priced at £9.50 each. Thanks for sharing with us you progress on the goldwork and for all the links on various goldwork embroidery. Lol, I think there should be some sort of psychological service out there helping us with “problems” like these. Can you imagine a lovely voice kept repeating to you: “this curve is fine, this curve is ok, you will love this curve. All will be well”?! LOL! You might be onto something, Jessica!! Gosh, Mary! Who knew! Wasn’t there a popular song with a chorus that repeated, “Koma-koma, koma-koma, koma-bim-bim!” [I don’t remember the “bim-bim” words.]? Let’s hope the delighted eye contemplating the finished work will not notice that humongous bulge! Wouldn’t the bump be less noticeable if you staggered the rows’ beginnings and endings? I’m also thinking the curve will seem to disappear once more rounds are added. Also, once the entire piece is finished, there will be lots more for the eye and mind to be looking at. Maybe this is one of those times to step back and look at it from intended viewing distance, rather than at working distance? If the “hump” really bothers you, there is one way to minimize it. In this kind of situation, I stagger the start. What I mean is that I leave about an inch between the start of passing thread 1 and 2. I start laying the first row and when I meet up with the beginning, I sink one thread, in this case the inner thread, near my first stitch and sink the second thread about an inch away catching it, the outer thread, in the “second” row of stitching. This is frequently used to end passing thread on a curve too. I am a bit suprised you find couching gold thread a little boring. To remedy at this sad situation I can see only two solutions : either you can add some ornements you did’nt plane before to make your work more fun or you continue the regular couching during a long session to take the rythm of the stitches and let your mind meditate. But perhaps you have to much energy and projects in your mind to reach this state of mind now. May be it could be better to wait a little and then go back again to the project … Thank you for sharing you experience and hope you will make progress soon. Hi, have you thought of using the bluethread then beads before adding the rest of the stitching. 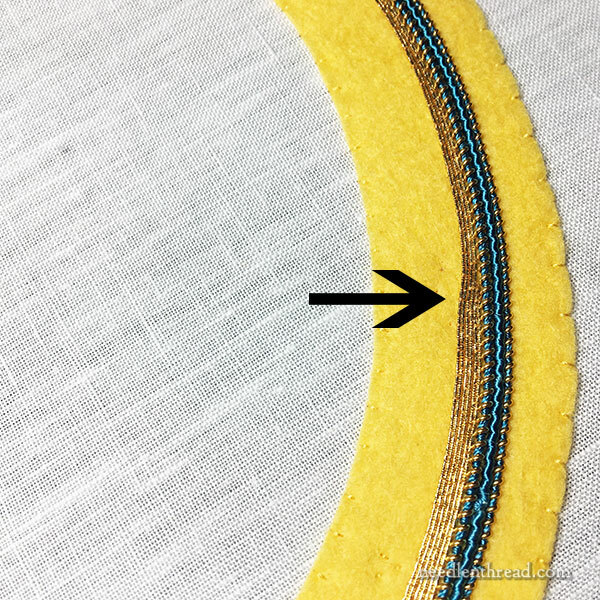 Next Next post: Back of Embroidery: 3 Tips for Keeping it Neat – When it Matters!